D-PRS Interface 4.0 is a Java application which can be implemented as-is on most platforms. It is shipped with PureJavaComm which supports Windows (32 and 64 bit), Linux (32 and 64 bit, ARM and ARM 8), Mac OS X, and other OSes via JNA. It also supports TCP connectivity to connect to D-STAR serial providers such as D-RATS and DVTool. 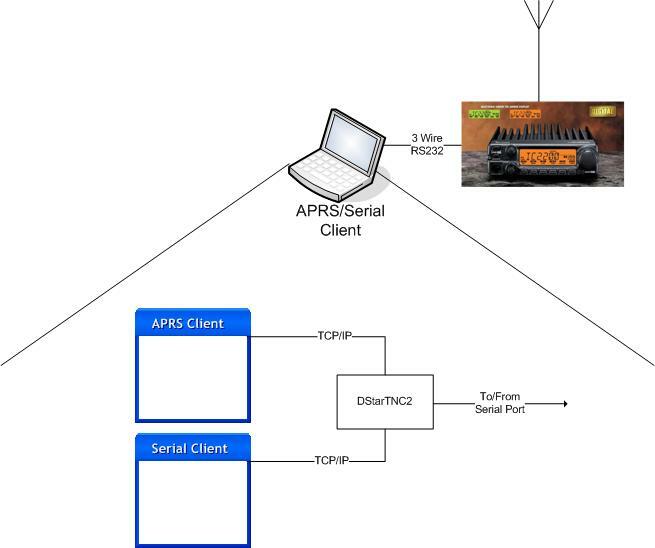 D-PRS Interface supports a TCP/IP port (default 14551) for APRS client(s) to connect to in exactly the same manner as the client would connect to an APRS-IS server. This port supports multiple clients. VHF and UHF D-STAR radios have a tracker capability (transmitting GPS provided position reports). D-PRS Interface converts these position reports from remote D-STAR radios to an APRS format on the APRS port so the client can see other D-STAR radios in addition to other APRS stations using D-PRS Interface or APRS packets gated to the D-STAR low-speed channel by javAPRSSrvr. D-PRS Interface also supports a TCP/IP port (default 14550) that provides a direct path to and from the serial port. This can be used by a telnet client or any other TCP/IP client to send and receive data to and from the D-STAR serial port. One such client is DStarQuery which is a fully customizable information kiosk for D-STAR. D-PRS Interface does checksum validation of the GPS mode positions received from remote D-STAR radios. It reduces the continuous position reporting that happens when a D-STAR radio transmits voice to a single position report to keep from flooding the client and APRS-IS. Radios in GPS mode (not GPS-A mode) must use the D-PRS calculator found elsewhere on this site to create a string that provides the checksum needed. GPS-A mode users read the next paragraph. Some recent Icom D-STAR radios do not transmit the C1 message with the GPS mode data making it unusable for D-PRS with those radios. The Icom IC-2820 introduced a new mode called GPS-A. This mode uses a CRC to wrap a TNC2 format APRS string for transmission. D-PRS Interface and javAPRSSrvr recognize that format and use that format for gating APRS packets to the D-STAR DV data stream. Users of newer radios should set their radios to GPS-A mode and set their UNPROTO to APInnn,DSTAR* (APInnn where nnn is the Icom model number, up to 3 characters). Finally, many D-STAR repeater gateways have DStarMonitor installed to provide gating of D-STAR positions to APRS-IS. To make use of this, set your RPTR2 to your gateway callsign (repeater callsign with a "G" in the eighth character position). This will allow the gateway to see the datastream and gate the D-PRS information to APRS-IS. D-PRS Interface requires Java 8 or later. For general reliability and security, be sure to use the latest Java. D-PRS Interface does not require Java be enabled in the browser so it can be safely used without the plug-in enabled. D-PRS Interface now requires JNA and PureJavaComm to communicate directly with the radio via a serial port. These packages are NOT required to connect to a TCP port. The latest jna.jar may be downloaded directly from the JNA support site. The latest purejavacomm.jar may be downloaded directly from the PureJavaComm development site. The JNA and PureJavaComm jars do not need to be renamed as version numbers are acceptable to DPRSInterface. D-PRS Interface is free for use by licensed Amateur Radio operators for Amateur Radio purposes. Commercial or governmental use, and redistribution in any form is prohibited. Commercial or government users may contact Peter Loveall AE5PL for licensing information.